Two hundred years ago, on the last day of January 1807, Robert Morrison embarked on a voyage to China as the first protestant missionary to that country. During the next sixteen years, whilst living at Canton and Macau, he accumulated an impressive collection of many thousands of Chinese books covering a broad range of subjects. Morrison was a quick and eager student of the Chinese language, and soon made his name with books on Chinese grammar and a large dictionary of the Chinese language (see the Morrison Bibliography for details of his many publications). His greatest achievement was his Chinese translation of the Bible, completed in 1819 and published in 23 volumes in 1823 (Morrison was responsible for most of the New Testament and 26 books of the Old Testament, whilst William Milne was responsible for the translation of the historical books of the Old Testament). When Morrison returned to England in 1824, for the first and last time, he took with him his entire collection of Chinese books in the hopes that it would form the foundations of a library for the study of Chinese in his native country (and, needless to say, for the training of missionaries to be sent to China). Although he was fêted as a celebrity on his return, there was very little interest in his collection of books. He had spent much of the voyage documenting his collection in a handwritten catalogue, but the first of many misfortunes that would befall his collection came almost as soon as he had disembarked at Salcombe, when he was presented with a customs bill for his books, valued at £2,000, which he could ill afford to pay. And when eventually the import duty on his books was waived, he found that neither Oxford nor Cambridge were willing to accept the donation of his collection on his condition that the recipient university establish a chair in Chinese. 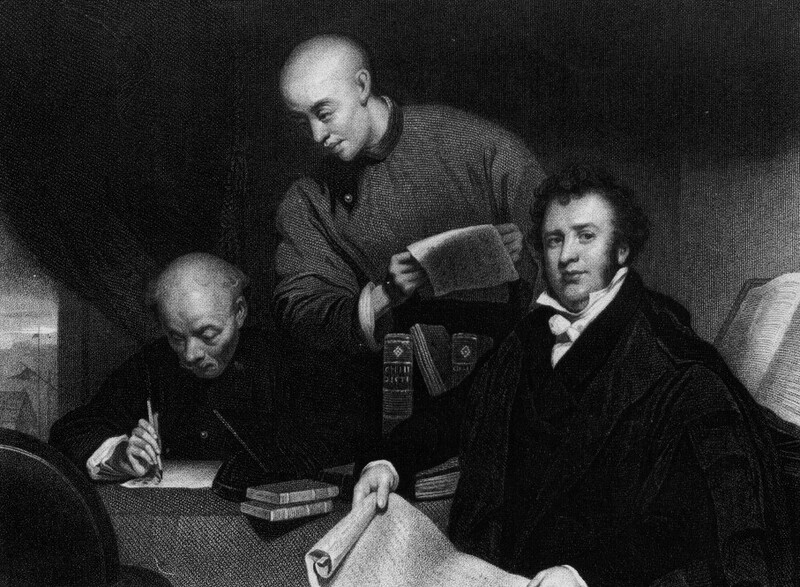 So when Morrison returned to China in 1825 he was forced to leave his collection in the offices of the London Missionary Society, where they remained in storage until after his death ten years later. Eventually, in 1836, the newly founded University College London (UCL) accepted the collection and established the first professorship of Chinese in Britain, a post held by Samuel Kidd (1804-1843) from 1837 to 1842. Morrison's books formed the Morrison Chinese Library, and were well looked after and carefully catalogued. However, when the School of Oriental Studies (later SOAS) was founded in 1917 it was agreed to transfer the Morrison Library to the new school on permanent loan, and in 1922 SOAS received from UCL 1,861 bound volumes (most of the Morrison collection had been bound in Western style bindings whilst at UCL), 2,374 paper parts, 24 parts in boxes, 4 rolls, 8 anatomical charts and 1 manuscript catalogue (i.e. Morrison's own handwritten catalogue). SOAS should have been the ideal home for the Morrison collection, but unfortunately the books of the Morrison Chinese Library were integrated into the main collection and it lost its distinct identity. In 1996, after seventy-five years of neglect it was decided to produce a catalogue of the Morrison books, and I was privileged to be entrusted with the task of cataloguing the collection, resulting in the first ever printed catalogue of the collection in 1998. Before I could even start to catalogue the individual titles I had to identify which books scattered throughout the SOAS library actually came from Morrison's original collection, which was not a trivial task. After all the books that could be identified as coming from UCL's Morrison Chinese Library had been gathered together it was found that some 76 titles in 185 volumes listed in the UCL catalogue slips (accounting for some 10% of the total number of bound volumes in the Morrison Chinese Library) were missing, together with an unknown number of unbound items. A handful of the missing books have since been found in SOAS Library, but the vast majority of the missing items must have been lost, stolen, sold or given away. Most of Morrison's books were on open stacks for most of their time at SOAS, and so many of the missing items, especially novels such as the pornographic Rouputuan 肉蒲團 "The Carnal Prayer Mat", can be presumed to have been stolen by unscrupulous students. However, the majority of the missing titles are large, multi-volume works that cannot have simply "walked". It is my belief that most of the missing Morrison books had been transferred to the Far East department's library after the war, and were sold or given away as duplicates when the departmental library was disbanded in 1972. This suspicion was strengthened by the discovery of five missing titles in the Bodleian Library, most marked with the stamp of Far East Department Library. A single book has also been traced to Cambridge University Library, but there are still dozens of titles unaccounted for in my List of Missing Morrison Books. So when last week Sue Small, the China section librarian at SOAS (SOAS only has a single librarian for its entire Chinese collection, and SOAS in its greed for cost-cutting and academic downsizing thought it sensible to sack her and other specialist librarians in 2005 -- now reinstated, but still under attack from the library management who want to downgrade her position), told me that she had found some books that might come from the Morrison Collection I was naturally very keen to see them. The books in question were two copies of the 1792 edition of Lengyan Zhengmai 楞嚴正脈 (commentary on the Śūraṃgama-sūtra). The books, each comprising six unbound fascicles, were marked with both the SOAS callmark and the UCL bookplate that had been attached to all the books from the Morrison Chinese Library when they were transferred to SOAS from UCL, and so they evidentally did come from Morrison's collection. Indeed, Lengyan Zhengmai 楞嚴正脉 was on my list of missing books as being recorded in Morrison's manuscript catalogue (#753 in 6 fascicles) but not in the UCL catalogue slips (which only covered the bound books, not the unbound parts). Where I wondered had she found these books ? The answer was that a SOAS graduate student had come across them in a secondhand bookstore in front of the British Museum (let's call it Q), where they were selling for £100 each, reduced to £40 each as the bookstore did not specialise in Oriental books and did not realise their true worth. The scrupulous student bought them, and instead of taking them to China to sell for a huge profit, kindly returned them to the library, and they are now reunited with the rest of the Morrison Collection. One more missing book ticked off, but many more left to find, so do take a look at the list of missing books and let me know if you recognise any of them at your University library or local secondhand bookstore (check for the UCL bookplate and the UCL shelfmark). though I personally will be waiting another seventeen years before I join in the celebrations. I think that Morrison would have been quite sad to see that the important legacy of his great Chinese library is not even mentioned in any of these bicentenary conferences.